Bolsover South or Carr Vale Station, The Viaduct and The Tunnel. Lancashire Derbyshire & East Coast Railway was planned as early as 1891 but was not operational until 1896, financed by the local colliery company at Bolsover and by the personal fortune of William Arkwright (1857-1925). LD&ECR days. Looking West. (Copyright Unknown). Plan from 1890’s Showing the Station Main Lines and the Building that was to become New Bolsover Social Club. Original Seal of the LD&ECR. Original Plans of the Station complex. The original Lancashire, Derbyshire and East Coast Railway was planned in 1891 and completed in 1896, financed by the local colliery company at Bolsover and by the personal fortune of William Arkwright (1857-1925). It passed through Carr Vale on its way from Chesterfield to Lincoln. It came into the Doe Lea valley from Arkwright and then over the Pleasley, Seymour Junction of the Midlands railway (Doe Lea branch line). With a splendid brick built eight arch railway viaduct and then uphill into the station at Carr Vale. The line then passed the preservative factory and sidings on the left which was supplied by local grown fruit to for preserving and jams. The line went uphill and into the Bolsover-Scarcliffe tunnel which was cut through the very bedrock of Bolsover and was plagued with water and subsidence whilst it was being constructed and throughout its life. The one mile eight hundred and sixty four yard tunnel yielded around two hundred thousand gallons of water each day as an undesirable by-product. The measurements of the tunnel are as follows 20 feet 9 inches high at the centre and 25 feet 9 inches wide and at 2,624 yards long one of the longest tunnels in the United Kingdom. The Bolsover and District Water Company was set up in 1903 to alleviate the problem. The water was used to supply softened and treated piped drinking water for New Bolsover to replace the metal water tanks and stand pipes at the back of the blocks of houses. It also replaced the wells and springs in Carr Vale and was pumped up to Hillstown to collecting tanks holding between them 64,000 gallons. By the 1920's demand had outstripped supply and bore holes were sunk on Bolsover Moor with a new water treatment plant being installed at Whaley. The water now feeds the fishing pond in Carr Vale. Tickets Owned and Copyright Glynn Waite. With Thanks. The Great Central Railway took over operations on September 12th. 1906. Looking East towards the tunnel. (Copyright Unknown). Waiting for the King & Queen. Possibly June 25th 1914, King George V and Queen Mary pass through Bolsover to visit the Duke and Duchess of Portland at Welbeck Abbey. (Copyright Unknown). An East Bound Passenger Train with the Preservative Factory, signal box and sidings, looking towards New Bolsover. (Copyright Unknown). Looking East towards the tunnel. The tower to the right above the track is the water supply tank for the Bolsover water works (Copyright Unknown). The cutting of the tunnel delayed the opening of the railway as it was riddled with small streams and faulting which made the roof prone to falls, this and the unreliability of the powder and fuse led to numerous deaths and injuries amongst the navvies, the railway company decided to have a horse and trap in attendance at the mouth of the tunnel as an ambulance to ferry the injured to hospital. 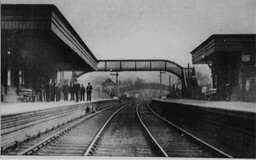 The station with the two foot-bridges.